You may have heard word from the Treasury that our paper currency will be undergoing cosmetic changes. 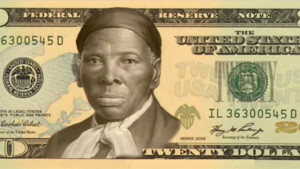 The biggest deal is that Harriet Tubman will be on the front of the twenty-dollar bill rather than Andrew Jackson. I think she’s a fine choice. Harriet Tubman offers something for everyone. There are the obvious superficialities - she was black, she was a woman - so those who feel we have to have icons representing certain physical characteristics will be pleased. She was a magnificent freedom fighter, a slave who escaped and then helped other slaves escape, and what could be more in line with American ideals than that? She should also be recognized as a hero by those who believe in the second amendment, since she carried a gun regularly and wasn’t afraid to make use of it. The religious right should be pleased as she is likely the most overtly Christian person ever represented on our money, professing to have visions wherein God would speak to her directly and offer guidance. If those things aren’t enough for conservatives, the man she’ll be relegating to the back of the bill was basically the founder of the Democratic Party. What’s not to like? There will be new faces on other denominations, mostly added to the backs in place of musty old buildings. For instance, the ten will no longer feature the United States Treasury, but will instead have a grouping of five female suffragettes. On the back of the five, portraits of Martin Luther King, Jr., Eleanor Roosevelt and Marian Anderson will replace the Lincoln Memorial. All in all, that will make nine new faces on bills. Should this trend keep up, our money is going to get awfully crowded. Nothing against any of these people, but I think we could make better use of our cash. If the government wants a truly informed citizenry (a debatable proposition, but we’ll forgo that for now) how about doing away with portraiture altogether and instead using that space to reproduce the most important WORDS in our society? How about we make our money a mobile civics class? People like pictures on their money, though, so I’ll suggest a way to make portraits more educational. Load our bills with the likes of Richard Nixon, Bill Clinton, Andrew Johnson, Marion Berry, Anthony Weiner, Rod Blagojevich and other politicians who have been impeached, resigned from office in disgrace, been imprisoned or otherwise been caught – perhaps literally – with their pants down. Make it a picture including that for which they are best remembered – Watergate, a crack pipe, an intern on her knees. That way, those seeking office could be forewarned concerning evils they may be contemplating, perhaps changing their ways before it’s too late and they show up in the rogues gallery. Since these changes to our money won’t happen until at least 2020, we could reserve a spot now for Donald Trump or Hillary Clinton and save time later. Well said and clever.. as you always are. Unfortunately, strong warnings have little sway for those unwilling or unready to take heed. Cigarette packages come to mind. Jeez, Sully - don't tell 'em that Harriet Tubman was a Christian, fercryinoutloud. . . Ya can't be mixin' religion with yer gubmint functions, like money, now can ya? I really like the idea of excerpting the Declaration and the Constitution on the money. That just fits, in lots of ways. . . But really - NOBODY wants to see Anthony's Weiner on their money. . .
Ha! Well said. I'm to the point that nothing surprises me any more. I am happy with the choice. Change is good. I have to laugh over the vitriol and emotional energy expended over whose face should be on money. Money isn't even real... it's a concept, and since there is no longer a gold standard, it's based on, well, nothing. And since I already have a whole lot of nothing, the face on the occasional 20 dollar bill isn't going to mean anything to me. If they want to do something constructive, how about stopping with the pennies? They cost something like 3 cents to make. Once again, I shake my head, utter, 'WTF' and then, I go on with my life. I use that same strategy for elections. And narcissistic bosses. Yes, put the words on the bills, and then teach the children to read them and what they mean!